A patient gets his teeth screened at Smile Alaska Style, YKHC's free dental screening at Cama-i 2019. The festival was located at Bethel Regional High School on March 30, 2019. 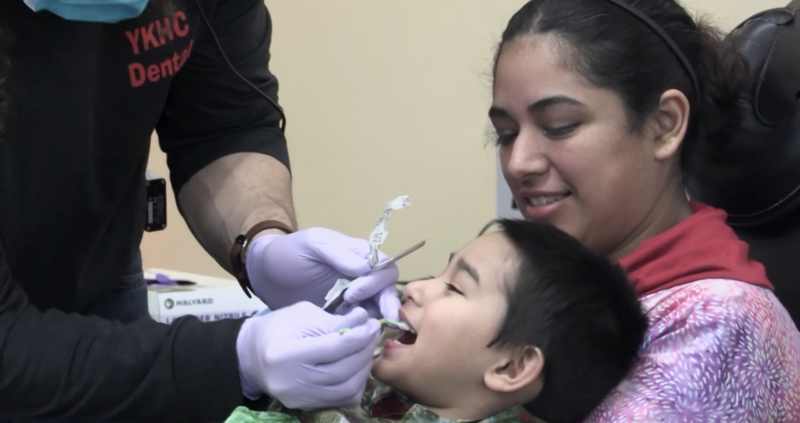 Every year dental care providers from the Yukon-Kuskokwim Health Corporation spend a day at Cama-i providing free dental screenings to festival goers. The goal is for people from across the region to meet dental providers in a friendly setting and to teach people how to take care of their teeth. Dr. Seth Davis: We’re here today doing a Smile Alaska Style. Smile Alaska Style is our free screening at the Cama-i Dance Festival, and it’s our chance to really access a lot of patients, and to get our name out there, and to just raise oral health awareness. We are the primary provider for all health services in the Y-K Delta. Most of the people in our area live in small village communities of between 80 to 400 people. We do have some larger villages up to 1,200 in Scammon [Bay] and Hooper [Bay]. And showing people that there’s a way to prevent tooth pain, to prevent cavities, to prevent having to miss school, fly your kids in from your village to Bethel to have something done, is so important. Aliysa Werba: I brush in the morning and then after I eat dinner. If there’s a cavity, I can catch it early so they won’t have to, like, have go all the way to my root. I don’t have any cavities. Take care of your teeth, kids. Dr. Bob Allen: Often going to the dentist can be sort of a negative thing, so we’re trying to make this a more positive thing. I was director of the YKHC Dental program for many years, and I’ve worked in the Delta since 1975. We started 30 years ago, actually. We wanted to get more people from, not just from Bethel, we wanted to have more people involved from the region, so Cama-i seems to attract people from all around.